How appropriate is it that Miami faces Nebraska-Omaha to commence league play? 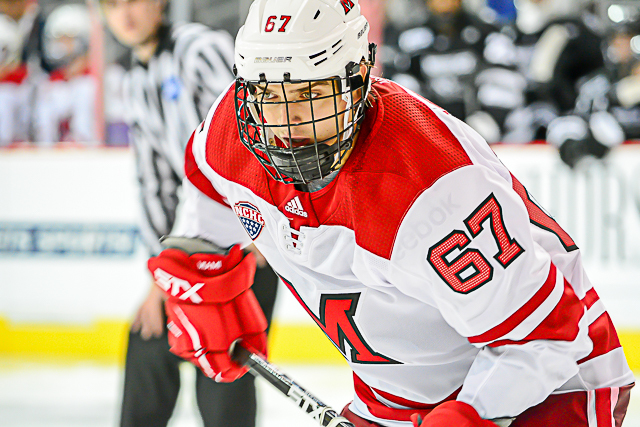 Six teams begin their in-conference schedules this weekend, and the RedHawks open their NCHC slate against the Mavericks after landing associate head coach Peter Mannino and multiple commits from UNO last off-season. 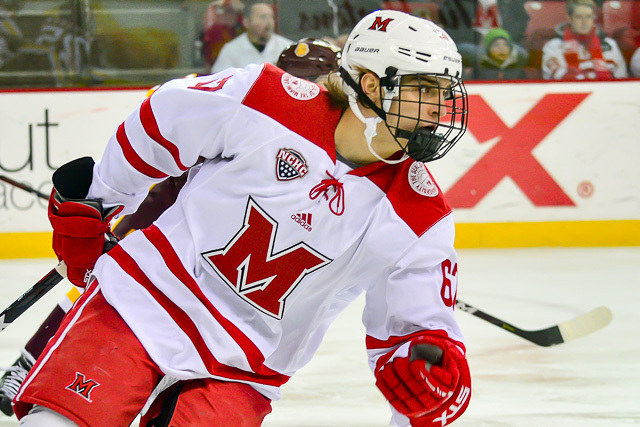 BoB takes a look at this weekend’s series between Miami and the Mavericks. WHO: Miami RedHawks (6-2) at Nebraska-Omaha Mavericks (0-5-1). WHERE: Baxter Arena, Omaha, Nebraska (7,898). WHEN: Friday – 8:07 p.m.; Saturday – 8:07 p.m. ALL-TIME SERIES: Miami leads, 20-17-6. LAST SEASON HEAD-TO-HEAD: UNO, 2-0-0. Jan. 12 – UNO, 11-7. Jan. 13 – UNO, 4-3. UNO RADIO: Both nights – KZOT-AM (1180), Bellevue, Neb. NOTES: Though the teams had identical 10-13-1 conference records last season and UNO finished just two games better than Miami, with Mannino behind the RedHawks’ bench his new team is 6-2 and earned the No. 20 spot in this week’s USCHO poll. Miami’s Derek Daschke (photo by Cathy Lachmann/BoB). Without Mannino and his commits – including defensemen and MU starters Derek Daschke and Bray Crowder – UNO is 0-5-1, losing five straight after an opening-night tie at Union. The acquisition of those now-Miami blueliners is especially noteworthy because the Mavericks have hemorrhaged in the goals against department this season. UNO has allowed 33 goals, including 11 on the power play and three shorthanded in just six games. Opponents are averaging 37 shots and scoring on 15 percent of them. The Mavericks have played all three goalies on their roster, and they have a collective 5.42 goals-against average and .851 save percentage. Evan Weninger has started five games and has a GAA of 5.01 and team-best save percentage of .872. He stopped 74 shots in last weekends losses at Arizona State but surrendered 12 goals, getting the hook after letting seven in Friday. Alex Blankenburg and Matej Tomek both have save percentages well below .800 in limited action. Dean Stewart is the lone Maverick defenseman to find the net this season, as he has scored twice and earned three more assists. The rest of UNO’s blueline corps has combined for just five points, all on assists, led by Ryan Jones’ two. Stewart, Jones, Lukas Buchta and Jalen Schulz are all returning regulars, having logged at least 30 games for Nebraska-Omaha last season. Up front, Fredrik Olofsson leads the team in assists (6) and points (7). Zach Jordan – a 16-goal scorer in 2017-18 – and Mason Morelli are tied for the team lead with three goals and are second and third in points, respectively. Tristan Keck and Teemu Pulkkinen have identical 1-2-3 lines. Four of the Mavericks’ top five points producers from last season graduated, and freshman and sophomores have a combined three goals and five assists in 2018-19, so UNO needs to hit the recruiting trail hard in the coming months. By comparison, Miami has generated 21 points from its first-year skater class. Last season, these teams met for one series, which was played at Omaha, and the RedHawks allowed 15 goals in the two-game sweep. While Phil Knies did score four times that weekend, Miami would like to see a better defensive effort at Baxter Arena this season. A couple of online sites list this game as being televised on one of the FOX Sports regional channels, but it’s not showing up on the DirecTV schedule. If it does pop up we’ll send an update on Twitter. 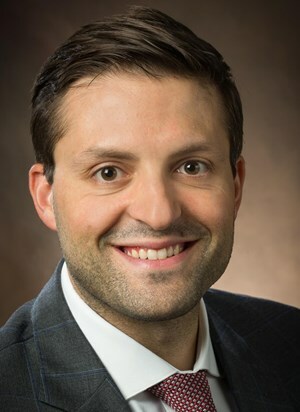 He was the starting goalie during Denver’s 2005 NCAA championship season and played six NHL games before turning to coaching, and behind the bench he has already won a Clark Cup title in the USHL as an assistant with Chicago. 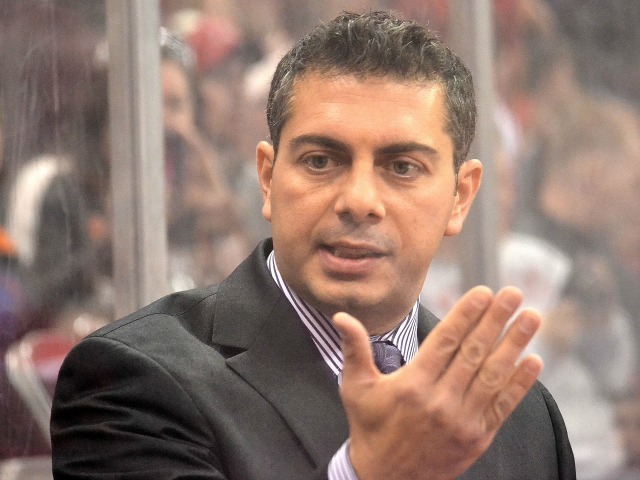 On March 29, less than three weeks after Miami relieved both of its assistant coaches of duties, Peter Mannino was hired into the associate head coaching role. Mannino moved to Oxford along with his wife, Alyta, daughter, Sienna, 3, and son, Luca, 1. BoB: You were named associate head coach this off-season, so what would you want Miami fans to know about you from a coaching philosophy perspective? 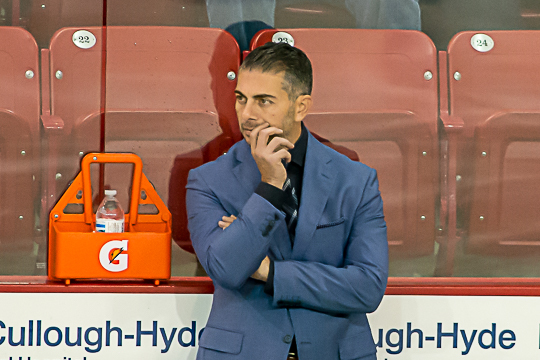 Mannino: I’m a very approachable, honest coach. One that really dives into the experience I had when I played. I try to bring that to the table because I never want to forget those days. My brain is at the same level as what they’re going through. That’s just the way I approach things, the way we ask (the players) to every day – be honest, work hard and be approachable, have a two-way communicative relationship. That’s what I really, really want the players to know, is that we care about them. We’re here to push them, on and off the ice, take care of them when we need to, push them when we need to and make them earn everything that they’ve deserved up to this point. Kind of all those little attributes, those words kind of pile up together and that’s the way things go with me and the players. BoB: You played at Denver and have coached at Nebraska-Omaha, so you seem like a perfect fit at Miami in terms of a coach who understands this conference and these teams’ styles as well as the type of player teams need to recruit to win in this league. Mannino: Absolutely. It was the same way when I played – I played in the USHL, I played junior hockey, I went through the different steps and levels, and what I’m really excited about is I was able to coach two years in the USHL with the Chicago Steel and work my way up. Because you see those players define their levels of college or next step in life, and I went through that for several years. I had a lot of success my second year and I was able to distinguish that level change for (those players) as they developed and when I went to UNO last year, first hand I was a part of it, from practicing to recruiting to game-like speed. I’m very familiar with the NCHC, which is so identical to the old WCHA when I played. BoB: Stepping back to your NCAA career, you were in net for every game of Denver’s title run in 2005 culminating in a Frozen Four played at Nationwide Arena in Columbus. Can you reflect on that experience, winning a national championship as a freshman? Mannino: Obviously the cliché: It was special. It was kind of unique too because (Denver) had won it the year before. So when I went in everybody was like, oh, you jumped on the bandwagon. No, no, no, I committed before they won, so actually we had a bullseye on our backs. We had to play honest every night because people wanted to get us. We were the defending champions but really it was kind of awkward because our freshman group wasn’t a part of that, but we were meshed into it. So it was really unique to be a part of a very special time at Denver hockey where they had just won – and it was an iconic Frozen Four – to then step foot into my position, there was a lot of what could’ve been looked like as pressure. But our group from seniors to freshmen, we meshed right away. We pushed each other, we held each other accountable and it just showed, game by game all the way to that championship, we all relied on each other and we all needed each other, it wasn’t just (Paul) Stastny, it was Matt Laatsch our captain – it was awesome. You have to have a team approach to win in the NCAA because it gets so hard, so tight, and one goal can change your career. It’s an eternal memory that I am obviously am very fortunate to have from when I played and moved on to play professionally, but now as a coach I cherish those memories because I can dive into those and talk to guys about them and hopefully help them. BoB: Your 2005 run is quite a story, because your dominant final stretch that postseason was preceded by a pair of games in which you allowed five goals each. You then posted three straight shutouts and obviously went 4-0 in the NCAA Tournament. What turned you around so quickly that season? Mannino: It’s that freshman year, right? You go into it, it’s a new team, new feel, new level, and my game was adjusting. I had ups and downs – I remember my first game getting pelted by Boston College then turning around and playing Wisconsin and having a really good win on the road. That’s what I tell the guys – you’ve got to use those (struggles) and get through them, and it’s the big picture. Just like you said: No one looks at those back-to-back five-goal games, but that was my journey. I needed to embrace that and get better and over it, and then in the end you look at the big picture and (the title) was the end result. You were just asking me about that year and the first thing I think of is the ups and downs. We had a tough start, we played some games in which we struggled as a team but those struggles are so important rather than just the back-to-back (titles). We needed to struggle to get to that point, to stay the course at the national tournament, so yeah, that was part of the journey. BoB: For those like myself who grew up dreaming of playing in the NHL but lacked the necessary talent, you made it to the NHL and played six games. What do you take from that chapter of your life in which you were able to play hockey at the highest level, albeit for a brief time? Mannino: A dream come true. Everything you do from when I was went to that first NHL game I wanted to be in that arena, be part of that crowd, and I remember telling my third- or fourth-grade teacher that I want to play in the NHL. That was my goal. The thing you learn is just how hard it is to get there. You said I played six games, but I was up for 50 games. No one ever knows that, but it’s so hard to get there, and then to play a game – guys get called up and sit around and they never get that shot. It is so hard but that’s what it’s so special, because of that, and it’s the group and the teams – everything around you from your parents to coaches to opportunities people give you. I could spend hours telling you: This guy believes in me, this guy believes in me, this guy called me and let me play here, this guy allowed me to get seen here. It’s all about finding people that you trust and taking advantage of opportunities. I did that for the most part and that’s what got me six games, but I’m fortunate for everything – I’m thankful to my parents, I’m thankful to every coach, every teammate, every team that I was a part of, because everybody played a part of it. BoB: You were a coach at Omaha, and the Mavericks have been slightly better than Miami in recent years, so what was the hook that brought you to Oxford? Mannino: You and I know and we have this conversation with so many people that last year, from where we were at Omaha, (we could’ve finished) anywhere, 4-through-8, the last few four weekends, and it was very stressful. In Omaha we were able to piece together a nice little finish there with some splits and some wins. The boys dug deep, we had a nice senior class, everybody played a big part of that, and we were able to stay in that mid-pack, and unfortunately Miami kind of flipped, right? That just shows you how special our conference is. In any given year – three years ago Miami won the NCHC. There’s so many differences in the year-by-year. For me it’s not about that, it was more opportunity, relationship-based: Rico Blasi the head coach and one of the founders here, George Gwozdecky, was my coach at Denver. So when I played in college, which is a special part of anybody’s career, when you’re there for four years, it establishes a culture, a mindset and just a belief in coaching and the whole philosophy. I’ve gotten to know Rico over the years, I know Jeff Blashill, I know the whole group that sort of mingles with George Gwozdecky, Rico and myself. There’s a trust – there’s a circle that you really know. So when things kind of finished up and I received a call from Rico, it was not like talking to a person for the first time, it was listening to a person who was offering up an opportunity that was incredible. The history here – 20 years that Rico has been at Miami, he’s been to the top. What he’s built here, the Brotherhood, everything about it is so special. I’ve played with Andy Miele, players like that, that are part of the Brotherhood, I’ve seen it firsthand from an alum in the pro levels. Played in the game here, you know that game Denver vs. Miami (in the Ice Breaker to open Cady Arena in 2006), that was me, I was in that game. So I wanted to work under and with somebody that’s had such a special coaching career and players can attest to that, the success of the program. I wanted to be a part of that, and that was a special thing to get offered that and to be a part of (this program) here today with Miami. And obviously that goes along with the school, everything from our AD to the president. This is such a beautiful campus, this whole setup, to live here with my family in Oxford – I’m from Michigan, my wife is from Illinois – you have that kind of hockey side of it and you have the personal side of it, and it just lined up, it made sense. I had to go through the process myself which was very tough because Omaha was a special place, great people – same thing, from ADs all the way down. But it was the right choice, 100 percent, this is where I needed to take that step and I’m very happy and very fortunate for this opportunity. BoB: You mentioned you were the goalie for Denver in the first game at Cady Arena. As I recall, Miami won that game. Mannino: Yeah, Rico sticks that to me every time. 5-2, I didn’t play very well, I probably overhyped the game because of all of the fans and the crowd and the students in the front of the building – I saw them while I was stretching. I hear it every day and every recruit hears it here too. But like it or not I’m kind of a part of the history here, and that kind of holds a special place because I didn’t play here but I did get a chance to play here, against them and feel the environment first-hand, and I think that’s an important piece to have when I talk to the players, to recruits coming in, is that I actually did play here, I know what this is like. BoB: You were hired in late March, and coaches and players were leaving left and right, then Miami was still piecing together its roster this summer, so how tumultuous has this off-season been as you transition here? Mannino: It was similar with Omaha, I think we had 10 or 11 players coming in – it’s the way it goes any time there’s change. When there’s change, you bring change because it’s time to kind of hit reset. There’s tough decisions, there’s players that move on. But in any of those situations or any losses that happen, a (Kiefer) Sherwood leaving early, losing a four-year player like (Louie Belpedio) and just other players moving on, it’s part of it. That’s the way things are today in college hockey. It’s a very, very quick-changing game with freshmen leaving, sophomores, people leaving just because they want to move. It’s a very loose field today, and it’s okay – that’s what we’re here for as coaches is to understand, players that sign early, move onto other places or can’t afford it, whatever might be. This is a life here, it’s not just that you’re going to play hockey. There’s money invested, not everybody’s on a full scholarship, there’s so much stuff that happens. I understand that, Rico understands that, (assistant) Joel (Beal) understands that – that’s part of it, it’s forever changing. We’re thrilled obviously – like you said, there were a lot of changes that needed to be made and gaps that we had to fill – and we’re really excited about that, bringing in a lot of experience, a lot of great character personalities and success levels before they got here. That’s what we do, we’re piecing it together. I was in the same boat last year and everybody does it because you lose a lot of players because (college) is a level where players are moving on. BoB: You were hired on March 29, and at that point most potential recruits’ seasons were winding down. So what has your primary focus been in the months since you accepted this position? Mannino: Initially, (Miami’s) season was obviously over, so I got to fly in and sit in on all the end-of-the-year, start-of-the-spring-season meetings. So I got to listen in on a lot of guys talking about where they were, where they wanted to go. We broke it down as a staff. That was very crucial. I know a really good amount of (Miami’s players), either coaching against them, USHL…I have a pretty good feel for most of the guys. Obviously I watched tape to get a good feel and then was just able to catch up in different sessions. You already know them, you pre-scouted against them last year and obviously coached against a lot of them when I was in the USHL so I have a good feel there. As a coach, as a recruiter you have to understand what you’re getting into, and I knew right away what I was getting, what you inherit as a group. That was a big thing because now it shifts to when I was hired, it was recruiting, getting to know the committed players, verbally and signed players. I got to know them right away. Get out there and see them if I haven’t – which is probably 90 percent of them anyway – and start the work for Miami right away. What are our holes, what are our needs? And we did that: We brought in defense, we brought in forwards to add depth in every area. With (goalie) Jordan (Uhelski), bringing a nice little competitiveness in the back end, that was the idea is making sure we’re hitting on all of our needs. So that was kind of it off the hop: Identifying the current, identifying the future players and then going after them from a recruiting standpoint. Rico and I hit the road a good amount and then when Joel came aboard all three of us were running. And then it was sit down, strategy, plan out and kind of prepare from there. Now we’re in practices, myself and Joel are working the penalty kill, working the goalies, working the systems. It’s a constant group effort, which is a big reason I wanted to come to Miami from the coaching side. BoB: How difficult of a situation is this to come into, with Miami having not gone to the NCAA Tournament three straight years after a long run of success? Mannino: Yeah, I think that’s it. We will see a different approach, a real good team approach, a hard-working, really good-skating, better mindset of defending. We’re going to see a really good goalie performance, whoever that is – I know Larks (Ryan Larkin) has carried the load here, and Jordan’s going to come in here and push which is all good competition. And we can say that throughout the lineup because we have depth. We’ve added pieces all around. We’ve added three Clark Cup (USHL) champions, you’ve added guys from the U.S. National Team or USHL, and those are pieces that are very, very important because that creates that culture and that championship mindset that we all want. Knowing (defenseman) Derek (Daschke), we won with him (in Chicago), and that’s the mindset of all of our players is you know that they can come in and contribute right away in all areas, up and down the lineup. And that’s all you can ask for is experience like that and maturity. So I think we’re going to have a very good year. It’s a stepping stone, every year, you wish you had one more here, one more there, but once again, that’s the way it is in college. Every team is looking at their board and they’re not complete. That’s just a fact. BoB: You mentioned Derek Daschke. He is a highly-touted defenseman who was committed to UNO after playing for you in Chicago but switched to Miami this off-season after your hiring. He has a solid reputation and a two-way blueliner who can score, move the puck, run a power play and defend well. Can you talk about him since he’s a player you’re so familiar with? Mannino: I know a lot of the guys, like Karch Bachman I coached in Chicago, recruited Bray Crowder, recruited Scott Corbett, recruited Monte Graham. I coached against (Phil) Knies when we were in the Clark Cup championship. It goes on and on and on. So I’m very familiar – this isn’t just one player. I know Larkin when he was in the USHL, I watched him in all of those festivals. I’ve seen all these guys, give or take a handful. (Derek) would be that mature, junior-experienced player that has had success and has gone through the gauntlet and prepares for it. His mindset is just like our other freshmen and sophomores moving forward, we feel like across the board we have a group that wants to be a group. BoB: It’s been fun watching Karch Bachman get better and better, as he started finishing those chances toward the end of last season. Mannino: You can say that about all of them, right? Everybody that’s still here is here to develop and continue to work toward that next level, and if not they’ve moved on to other levels or they’ve graduated. Kind of the fun part about college: It’s a very developmental stage. These guys have holes in their game that they want to work on every day and they have those strong attributes, like Karch can skate, he can shoot the puck, so what do you do with it? He’s been great – he understands it, identifies it and attacks it. Go after it, get better. BoB: The former assistants had specific in-game roles, like Coach Brekke handled the defensemen. Being a former goalie, will you handle the netminders, and do you and Coach Beal know what your duties will be once the puck drops? Mannino: Defense, PK, Joel and I will be working hand in hand in those areas, because if one of us is on the road we want to be up to par there. Obviously the goalies are a special nook – that’s one thing I’m going to be working with every day. What I will say is going into it with Rico is he’s been awesome and receptive, asking Joel and myself whatever it is. We’re open on all cylinders here, drills, practice flow, plans for scheduling – that’s the fun part is learning under Rico and all contributing in all different ways, because that’s what we ask our guys to do. I think it’s a productive environment behind the scenes that we can all be on the same page too. After a whirlwind spring, Miami once again has a full complement of coaches and within a few weeks its 2018-19 roster will likely by finalized. But several unanswered questions still surround the RedHawks heading into the season as they hope to halt their run of three consecutive sub-.500 campaigns. BoB takes a look at some of those issues in the summer 2018 edition of State of the Program. Q: So what’s up with the struggles the past few years? A: I would say the biggest issue for Miami since 2015 has been depth. 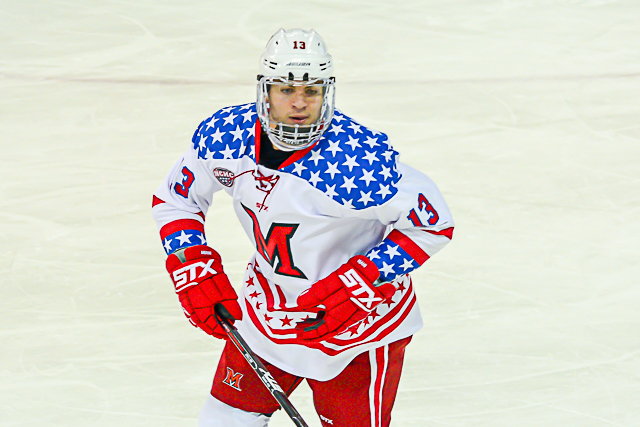 The Josh Melnicks and Grant Huttons are as talented as anyone to don the Red and White, but when the RedHawks were qualifying for the NCAAs annually and winning conference titles, they essentially had five lines, four defensive pairings and a suburb goaltending duo. By the way, the 17-point scorer was Nathan Davis, who was hurt for half of his junior season, and the guy with 14 was Andy Miele, who played just 18 games his freshman year, coming in mid-season. Yes, there is more to forward-ing than racking up points, and yes, that was against CCHA competition and not the NCHC, but the dropoff is still stark. Name one of those guys who was easy to play against. Last season the top-end defensemen were fantastic but opponents’ Grade-A chances were at least double those faced eight years prior. 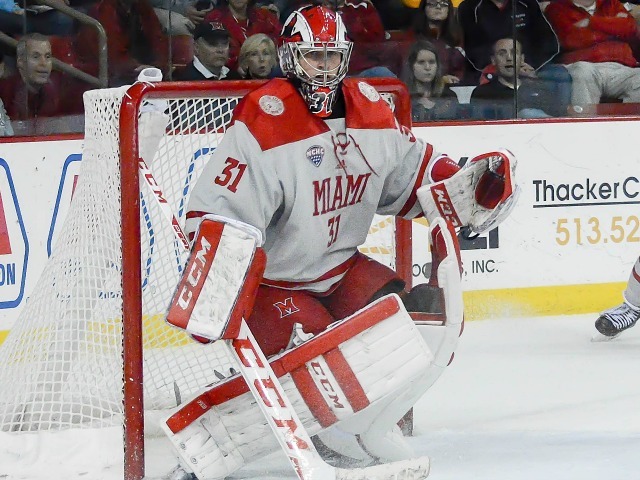 Every season Miami has fared well in the postseason it has had two strong goalies. In that 2007-08 season, Jeff Zatkoff posted a .933 save percentage. His backup, Charlie Effinger, went 6-0, 2.16 and .912 and still played fewer than 400 minutes. It was Jeff and Eff, then Cody and Connor, then Jay and McKay. Competition is healthy, and those tandems motivated and fed off each other. Junior-to-be Ryan Larkin thrived as a freshman but was at .886 in 2017-18 and his backups were well below that mark. The last time a goaltending leader had posted a goals-against average above three was 2001-02. Larkin’s was 3.12. Again, depth. Miami has been so deep in net it has typically rotated the past decade-plus. A strong showing by a No. 2 could’ve pushed Larkin to more success. Now, people may say comparing 2017-18 to some of the best Miami teams is unfair, but those teams made deep runs in the NCAAs, and isn’t that the ultimate goal moving forward? Q: Assuming you’re right – and you rarely are – why has depth been a problem the past few years? A: The athletic department and/or the hockey team obviously felt like recruiting was a primary reason, as both assistant coaches were moved out of those roles as soon as last season ended. I definitely think that was a large part of it, which pains me to say because Coaches Brekke and Petraglia bleed Miami red and worked so hard to keep this program on a successful course. But a key to their demise was the incoming 2016-17 class, when the RedHawks needed 12 freshmen to replenish talent after suffering major losses at forward, defense and in net. Only seven of those players will dress as juniors this fall. Q: Are there any other reasons high-end players aren’t coming to Miami? A: Unfortunately, when a team isn’t performing well, it’s tougher to persuade the next Austin Czarnik to come to Oxford. A lot of the negativity surrounding those sub-par teams over the past few seasons may have also stained the culture’s image to a degree. Especially in the social media era, the hockey world is a small one and extremely tight-knit. Picking a college is a huge decision for an elite player and he’s going to balk at one that has perceived internal problems. That said, bringing in new coaches could have a cathartic effect. And the good news is that Miami is still an excellent school in a beautiful town, playing in a state-of-the-art facility that is the envy of the Division I world. Those attributes of this program will always steer quality recruits to Oxford. Q: What is Coach Blasi’s status? A: There are more rumblings each off-season, but he still has five years left on a multi-million dollar contract. That deal doesn’t expire until 2023. So for those who want him out, he’s not going anywhere. Maybe if this losing trend continues for a couple more seasons, Miami would eat the final couple years on his contract. Maybe. Personally, I thought his in-game coaching was markedly better last season. The team just didn’t have the guns to make a much-needed postseason run. Q: Are these new assistants any good? A: We’ll find out soon enough, won’t we? To be fair, they’re inheriting a team of players that didn’t recruit, so it’s going to be tough to evaluate them for a couple of years. 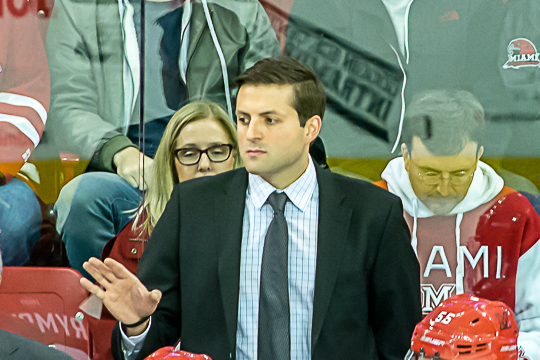 Still just 34, Peter Mannino moves into the more revered role of associate head coach, which was Brekke’s position. He is a former goalie that won a Division I title with Denver, played eight years in the pros including a cup of coffee with three NHL teams, and this will be his third season behind the bench. 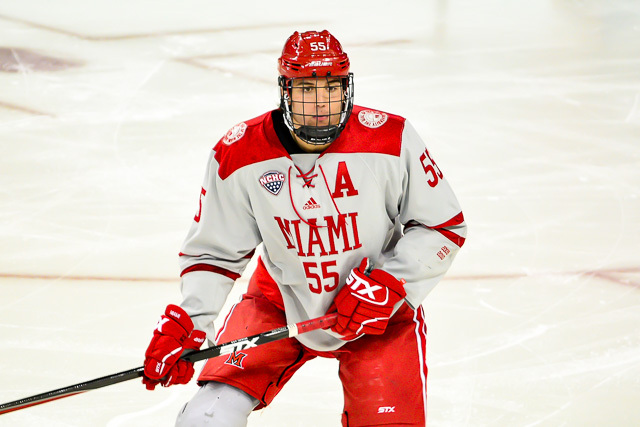 Coming from an assistant’s role at Nebraska-Omaha and having played at DU, he should be extremely familiar with the teams in this league and the types of players he will need to recruit to help Miami win in the NCHC. The other thing with Mannino is several players previously committed to UNO may now come to Miami as soon as this fall. That could make a huge impact on a team that currently has just 15 skaters on its roster. Joel Beal has been a D-1 assistant for Union and Sacred Heart the past seven seasons, so he has much more coaching experience. It will be interesting to see where Miami draws its next generation of players from with these coaches at the helm. The RedHawks had a long-running Chicago-area pipeline, but those connections may have dried up and recent rosters have featured more of a Michigan flare. Q: So is this team going to be better this year? A: It’s really hard to say, especially with so many still-unfilled holes on the roster. Phil Knies (photo by Cathy Lachmann/BoB). It was very encouraging to see how well Miami played down the stretch, taking St. Cloud State to overtime in Game 3 on the Huskies’ home ice. There was also a lot to like among the freshman class. Phil Knies posted 11 goals, Casey Gilling tallied 19 points and was a stud on defense and in the faceoff circle, and Ben Lown dished for 11 assists and was also a solid penalty killer. Alec Mahalak and Rourke Russell showed lots of promise on defense, with Mahalak running the power play at times later in the season. But nine players are gone from that 2017-18 team. Graduated are Louie Belpedio, Scott Dornbrock and Conor Lemirande, Kiefer Sherwood turned pro, Carson Meyer transferred and the team is not bringing back Willie Knierim, Bryce Hatten or the Alger brothers. Exactly who is coming in this fall is still a huge question mark with several players possibly following Mannino to Oxford, and internet speculation is running amuck, so we’ll leave that for the next post. The point is: That’s a lot of players to replace when a year ago Miami thought it would only lose three guys this off-season. When the full roster is posted it will be easier to assess the 2018-19 version of the RedHawks.